We had the pleasure of taking 5 minutes with BBC Radio 1 presenter Chris Stark. Chris began his radio career at the age of just 16 and has successfully worked his way up to co-host on the Radio 1 Scott Mill’s show. Some of his interviews have caught the media’s attention due to his unorthodox style, but with his huge love of football, beer and Ruark, Chris is just a down to earth guy! Hi Chris, How are you? Really good thanks. Loving being back on the radio after a bit of a Christmas break. Tell us what started your interest in radio? Is it something you have always wanted to do? I’ve always had a love for music and radio. I was a huge fan of Chris Moyles (Radio 1) at school, and round about that time I had joined up to my local hospital radio station at Northwick Park hospital. Radio is something that has always grabbed my imagination from a young age so it has easily been an ambition for most of my life to end up on BBC Radio 1. It is the most fun job in the world and I feel so lucky to be there. I also feel very proud as I do think you have to make your own luck, and it’s been a long journey from being 14 and a huge Radio 1 fan, to being a presenter on the network. 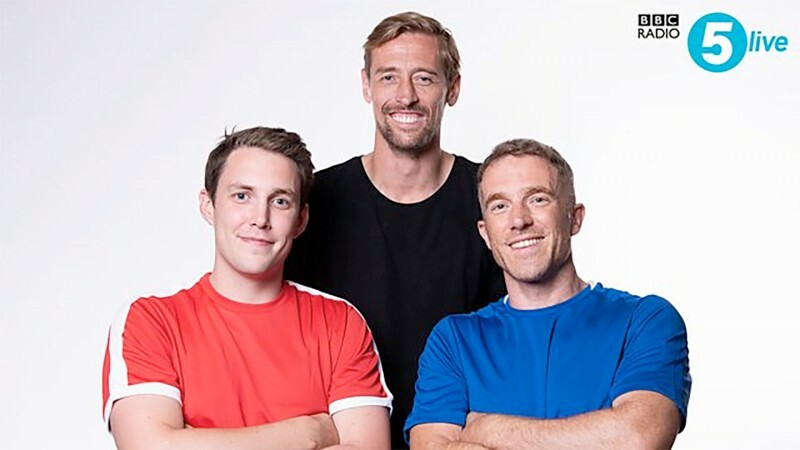 It’s no secret that you’ve got a huge passion for football, and your latest project is ‘That Peter Crouch Podcast’ where you sit down with Peter Crouch and Tom Fordyce to deliver a 12-part guide on how to be a professional footballer. Tell us about that experience? It’s been a great project to be part of. Truthfully, it was only going to be one episode, we didn’t want to put a lot of pressure on it. But that seemed to go well so they let us have a proper run at it. I’ve loved making this podcast, as you can shape it more easily than anything you make for tv or even radio. Podcasts are very intimate and you feel like you are building a community from the ground up. I had a really good feeling about it from the first record, but that said, I’m astounded how well it has done. What’s the strangest thing you’ve ever had to do for radio? Anyone who knows me from Radio 1 will know that there is an endless list of answers I could give to this question. Probably the most surreal experience for me was when we had Prince William and Kate Middleton on the show. It was clear Prince William listens to the show a bit, so I felt I could ask a few questions that you would not normally hear them asked. Asking the future King if he watches Game of Thrones (amongst other questions) was a particularly strange but brilliant moment for me. If you could give one piece of advice to someone looking to get in radio, what would it be and why? Do not worry about representing something different to any other ‘presenter’ you see. You can become paranoid but it is actually your biggest strength and ultimately what will make you a different proposition for any bosses. Be persistent, I did so many different types of work experience just trying to find a way to get a foot in the door at the BBC. Be creative, and explore creativity every way you can. Help other people, and weirdly I find that comes back round. That’s more than one point but hopefully all valid. What would you say is the highlight of your career so far? I can’t pinpoint one overriding highlight really. My favourite moments come when we have had what we feel is a great show, or when you step out in front of thousands at big weekend representing Radio 1. I’m lucky to have done and to be able to continue to do a lot of cool things. One of the highlights for me was when filming for a tv show I made for the BBC during the world cup. As part of it I had to take penalties against Ricardo, the Portuguese goalkeeper who knocked England out of the World Cup in 2006. I remember crying when that happened. I got my revenge though, managed to get one past him wearing a Steven Gerrard mask hahaha. There’s been a lot of funny moments. You’ve met a number of incredibly famous faces; has there ever been a time you’ve been very starstruck? Will Smith is one of the nicest guys in the world, but equally one of the coolest. I must admit I was a bit star struck when interviewing him. IT’S THE FRESH PRINCE!! You’ve previously said you like to discuss day to day things like going to the pub with big stars, and when you interviewed Mila Kunis in 2013 for the film Oz the Great and Powerful you managed to discuss both your local pub and Nando’s, what was Mila’s reaction to that? Well a lot of people saw how that went. I’d never done a ‘junket’ interview before and that was definitely quite a first one to do. I actually called Scott (Mills) after the interview to apologise as I thought I had mucked it up. However, looking back, I think people liked to see someone not trying to catch out actors, like a lot of journalists do. It got ridiculously big that though, millions of views. Two days later I found myself on Good Morning America. It was a crazy week. It showed me that it’s ok to be yourself, and that there was a place for that. Has your style of interviewing ever got you into trouble? Not really because I’m never out to get anyone. I don’t really care about gossip or relationship rumours. I think a lot of journalists or interviewers can be quite disrespectful on that front. I’m more interested in how I can relate to people I speak to, what’s on a level between their mad world and our normal one. You have done quite a bit of TV work lately, do you prefer TV or broadcast? Radio has always been my passion, but TV gives you the opportunity to be creative in different ways. It’s hard to compare the two. However, for me personally, radio is my first love. 2019 is already really busy. We’ve got loads of big plans for the Radio 1 show over the next year, including something really fun we are planning for comic relief. I’m currently filming a new series for BBC Sport about the FA Cup, and looking ahead to the next couple of months… we have to, of course, figure out if we go again on another series of that Peter Crouch podcast. When/how did you first learn about Ruark Audio? I actually first used a Ruark speaker at a hotel I was staying in. By coincidence, I was recommended Ruark by a mate and it hasn’t disappointed. We recently bought a new house so we are currently having lots of house parties. I love the look of the speakers but for me, the sound quality is ridiculously good. You are a true Ruark fan with both a R4 and our latest addition MRx. With your background in the music industry what drew you to Ruark Audio? I love the company. They clearly care so much about the craft of the speakers they produce. The look amazing, and sound a cut above. I think everyone can get used to a certain level of sound quality through the obvious smart speakers, however if you are a music fan, I think it’s way better to hear your favourite songs through the best quality speakers. And lastly, what’s your favourite song? New Radicals – ‘You Get What You Give’, or pretty much anything by The Streets. If you too are a fan of New Radicals or The Streets like Chris, learn to fall in love with them all over again with help from Ruark Audio products.